One of the most famous coins of all time is the EID MAR denarius issued by Marcus Junius Brutus in 43/42 BC. When Julius Caesar crossed the Rubicon, he threw Rome into more than three years of civil war, eliminating his opponents along the way. In 49 BC, many leading citizens, including some sixty Roman Senators, had come to see Caesar as a power-grabber who wanted to make himself king. This was an unacceptable situation for men like Brutus, who wished to retain their beloved Republic. Brutus, who was a trusted friend of Caesar's, conspired with a group of his fellow senators to assassinate Caesar. This group of conspirators called themselves the Liberatores or Liberators. They believed that they would liberate the Roman Republic from the threat of tyranny by a monarch if they could remove Julius Caesar from power. In 44 BC, on the 15th day of March, a day is known in the Roman calendar as the Ides of March, Brutus and his co-conspirators struck. Using daggers they had hidden beneath their tunics, they flew at Caesar in a hail of knife blows, stabbing him at least 30 times. When Caesar realized his good friend Brutus was among his attackers, he asked, "Et tu, Brute?" ("You, too, Brutus?"). As Caesar lay dead on the steps of the portico, Brutus jubilantly shouted, "People of Rome, we are once again free!" Unfortunately for Brutus, the general populace was very fond of Julius Caesar. Marcus Antonius (Marc Antony) took advantage of the breach in leadership and loudly condemned Brutus' actions. Brutus was forced to flee Rome with his soldiers. After several military encounters, Brutus's forces fell to Mark Antony and Octavian (who later became Caesar Augustus) in 42 BC. Brutus committed suicide before he could be taken prisoner. Ancient Roman military commanders like Brutus had to pay their soldiers, and they generally did so with a silver coin called a denarius. They frequently minted their own coinage, in mint workshops that traveled with the army. They often used these coins as a means of propaganda, or to commemorate major victories. In the case of Brutus, he issued a series of gold and silver coins commemorating the assassination of Julius Caesar. Two Daggers and a Liberty Cap - and the Portrait of a King? 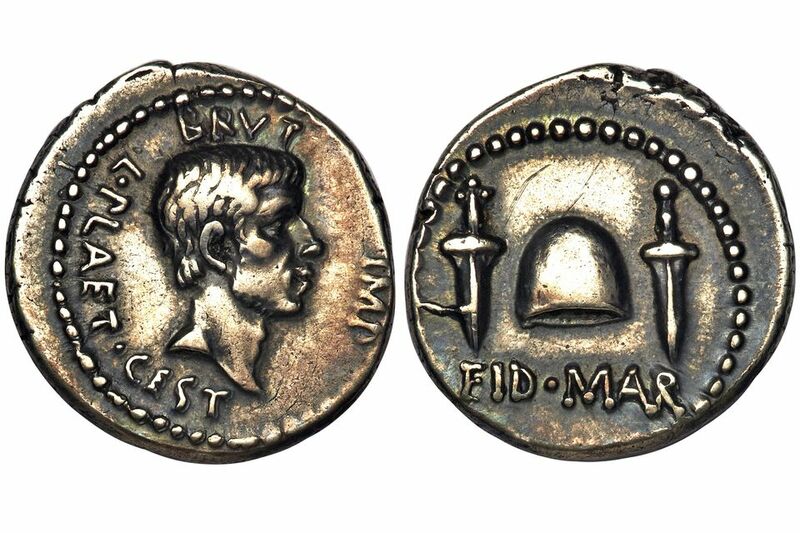 Brutus issued the EID MAR silver denarius to remind his soldiers that they fought for the Roman Republic. The reverse of the coin bears the images of two daggers, between which is a liberty cap, an ancient symbol of freedom. The inscription reads EID MAR, meaning "Eidibus Martiis" or "the Ides of March." The message was intended to convey that on the Ides of March, Brutus set the Romans free. However, there is a curious inconsistency here: In ancient times, especially in Republican Rome, it wasn't considered seemly to put the portrait of a living person on a coin. Sometimes gods were depicted bearing a marked likeness to the actual ruler, but to boldly place your own image on the coins was to risk being seen as a king. In fact, it was Julius Caesar's likeness on his own coins that helped foment the insurrection against him. Here we have Brutus doing the same thing! The obverse of the coin features a portrait of Marcus Brutus. The inscription reads BRVT IMP L PLAET CEST, which means Brutus, Imperator, Lucius Plaetorius Cestianus. Lucius Plaetorius Cestianus was the moneyer who managed the mint workers who produced the coin. The Moneyer's name usually appeared on Roman Republican coinage and was a sort of assay mark, guaranteeing the quality of the metal. Imperator meant, roughly, "honored military commander." About 60 specimens of this remarkable coin are estimated to exist in silver, with two known in gold. Silver specimens in extremely fine condition have sold at auction for $120,000 including fees. Lower grade silver examples occasionally come on the market for around $50,000, making it an expensive proposition to add this historically significant coin to your collection.